It would be easy to fill an entire book with terminology pertaining specifically to Murano glass. Murano glass is an exceptionally complex art with many different techniques and combinations. Without diving too deeply into the minutiae of technique and terminology, here are some of the main types of glass that you will come to recognize if you take the time to have a careful look. Avventurina refers to colored glass that incorporates iridescent particles, sometimes gold, copper, chrome, or other metals. This process has been used on Murano since the early seventeenth century and is sometimes called pasta stellaria, referring to its star-studded appearance. Filigree (filigrana) involves incorporating narrow rods of glass on the surface of a vessel or as a freestanding work. Creating designs with thin, delicate rods of glass is exceptionally challenging, requiring a high level of patience and skill. The two most common subtypes of filigree are retortoli and reticello. Retortoli fligree has the effect of “twisted” canes of glass, achieved by stretching and rotating the glass as it is heated. Reticello refers to a type of decoration incorporated into a glass vessel that gives the effect of lattice or cagework. 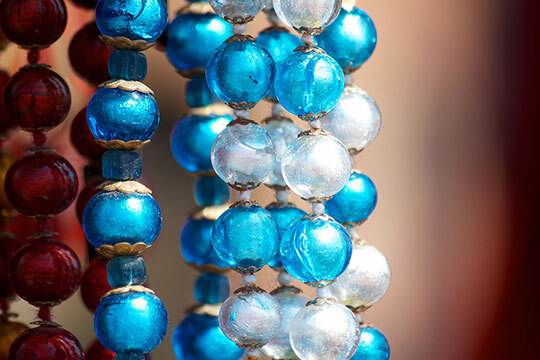 Murano glass techniques lend themselves naturally to the making of jewelry and beads, and some Murano glassmakers are specialists in this area. Some of the more accomplished masters pair glass with incised silver and other precious metals. By the fiteenth century glassmakers finished deeply hued glass pieces, only to embellish them with enamelled colors and gilding applied with paintbrushes. Because the enamelling process requires a second high-temperature firing to seal the colors on the exterior surface, putting the vessel at risk of deforming, it is a particularly challenging technique. The murrina technique involves slicing canes of glass to expose transverse patterns, and it can be used to create repeating decorative elements. Glassmakers have made murrina since ancient times but Venetian glassmakers developed a renewed interest in it during the Renaissance. 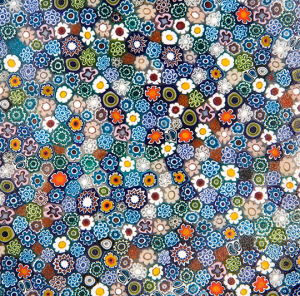 Literally “thousand flowers,” millefiori is a type of murrina. In millefiori, the glassmaker slices rods of layered glass to expose a flowerlike design on a clear or light blue disk of glass. Millefiori is popular for pendants and earrings, since an individual flower can be isolated for a simple and beautiful effect. Incised or engraved glass involves creating a fine-lined figural or decorative design on the glass, an extremely paintstaking art whose effects are particulalry beautiful given the delicacy of Venetian glass. Unlike thicker glass from Bohemia and elsewhere, Venetian engravers cannot cut far into the thinly blown glass on Murano; instead, the designs lie right on the surface. Today engravers use diamond-point wheels as well as other tools made with different metals and hard stones to create lines of various widths and levels of opacity. It is commonly accepted that a Frenchman named Master Robert from Lorraine introduced plate glass to Murano, thanks to a permit from the Venetian government that allowed Master Robert to stay and work on Murano for a period of six months in 1493. In addition to introducing the idea of plate glass to replace leaded bottle glass in windows, plate glass also began to be used for mirrors, replacing the metal ones that Italians used prior to that time. In 1507, the Venetian Council of Ten granted permission for mirrors to be made on Murano. The process involved glassblowers, metal workers who prepared the tin and mercury backing, and a craftsman who fused the metal and glass to finish the mirror. The art of engraving or incising mirrors continues today, and these ornate mirrors are enjoying renewed vogue among today’s interior designers. In vetro pezzato or “pieced glass,” large bits of different colored glass are melded together, giving the appearance of a patchwork quilt. Have you discovered something wonderful on Murano? Drop a comment below. I love to hear your stories! Thanks for educating us about the different types of glass. All we really knew is that Murano glass looks beautiful! Janice has several pieces of lovely colored Murano glass earrings, bracelets and necklaces she picked up in Venice.